Alpena Community College Student's Demi Oliver and Amanda Johnson examine exhibits at the Great Lakes Maritime Heritage Center Wednesday morning. 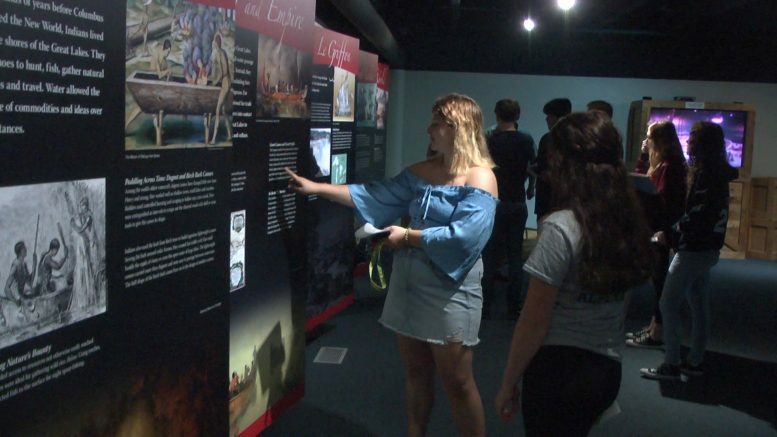 Alpena — Alpena Community College students took a break from the classroom and browsed through the Great Lakes Maritime Heritage Center to learn how different waterways and vessels played a pivotal role in helping shape northeast Michigan. The American history class had to sift through the information and artifacts provided at the museum The goal was to get a better understanding of how Native Americans and European decedents utilized waterways and vessels to begin building communities. Students also examined the industries built from these early vessels. Shipwrecks help students learn through recovered artifact and information materials that are now preserved in the center. “Being able to go somewhere and see artifacts and what went on, in person, it’s a lot better to do that than going online and researching,” said Student Garett Miller. The focus of the exercise look at activity before the Civil War. Students had to go out and find the oldest artifact in the museum, the types of cargo on shipwrecks and other vessels, and different modes of transportation at that time. “You can actually see everything that’s been found more than just talking about it in the classroom, so it’s a great visualization of everything,” said Student Amanda Johnson.